Sanja Vatra asked me to take some pictures of her fire show during the Uferlos Festival last week. I was more than happy to oblige. The weather was horrible, it was raining cats and dogs. Despite this, a nice crowd gathered to see a great show. 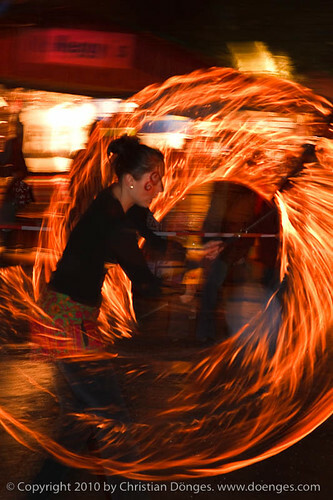 In order to get the fire swirling and some of the background, I dragged the shutter at 1/3s. The auto-focus of the Canon 5D decidedly did not feel up to the task, so I used f/8 for a good depth-of field and focused manually. These choices left me to use ISO 400 in order to expose the fire right. I then fired the flash on ETTL with -1EV compensation to Sanja properly. Judging by the recycle time, the flash was firing full pop. Have a look at my Flickr! photostream for some more pictures. Walking the streets, I came upon a fascinating construction site. 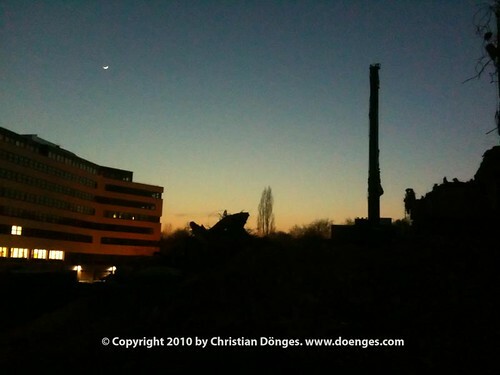 An older concrete building was being torn down to make room for some modern apartment buildings. As I watched, the last glow of sunlight disappeared and the moon became the brightest object in the sky. The rubble and the construction equipment turned into silhouettes, giving them a strange quality. 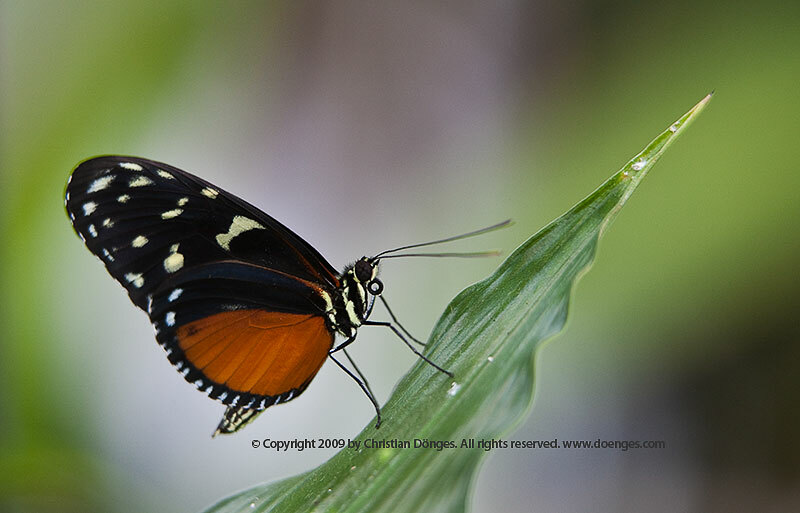 Black and yellow butterfly on a green leaf. 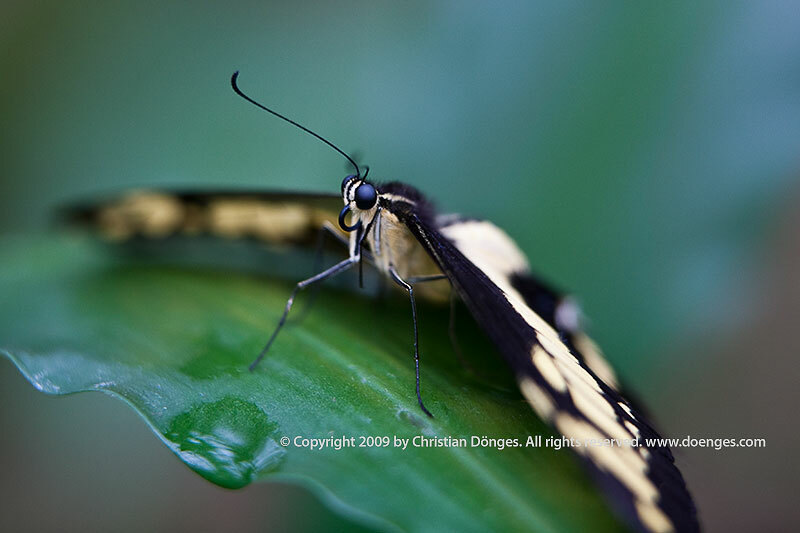 Notice how the narrow depth of field draws your eyes to the eyes of the butterfly. I feel as though it will dip into the drop of water for a quick drink before taking off again. Unfortunately, I did not take any notes and I can not find the name of this wonderful little critter. 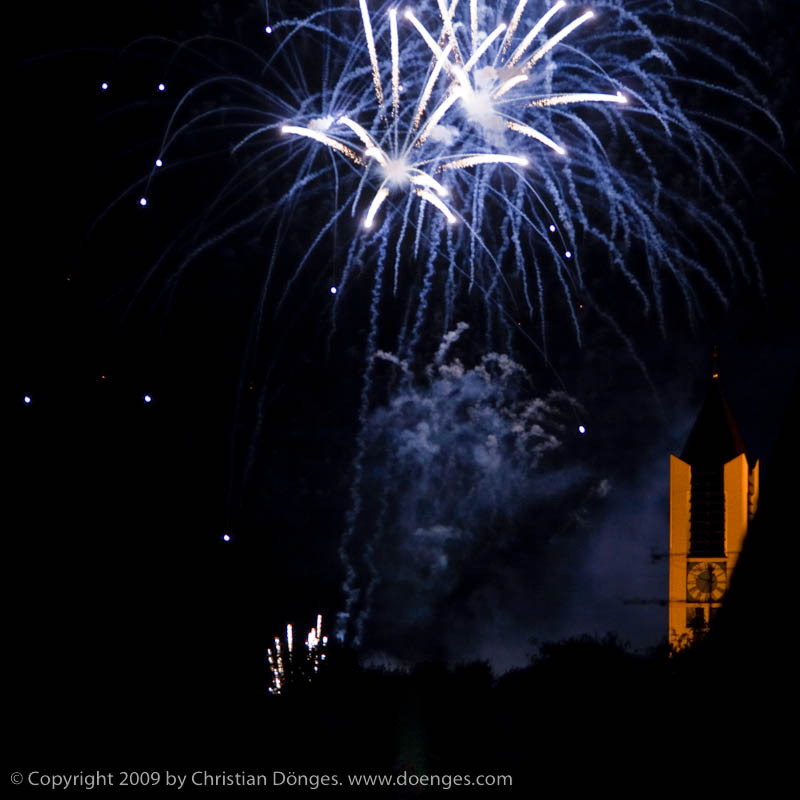 Blue Fireworks over Church Tower. Set your camera on a tripod and use a cable release or a remote control (infra red remote, RadioPopper, PocketWizard, you name it) to trigger the exposure. I use a simple remote control cable. Turn off the auto-focus and manually focus the camera (usually to infinity). This is faster and more reliable than having the AF hunt the night sky. Crank up the ISO as far as you are willing to live with the noise. For example, on a Canon 5D, ISO 800 is great and ISO 1600 is acceptable. A Nikon D3X will go even higher, as will a Canon 5D mark II. A pocket digicam will probably struggle at ISO 400 and above. Experiment – preferably before the big event. Use manual exposure mode and open the aperture as wide as it will go. Still in manual exposure mode select a good exposure time. I find that between 1/125s and 1/8s works well. Expose at will and enjoy the show! 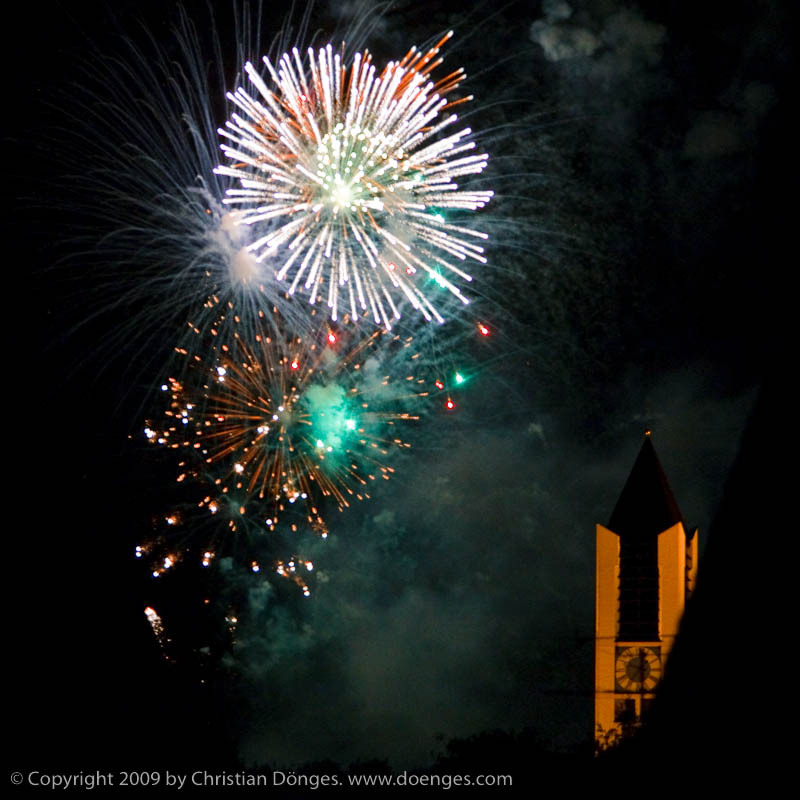 Green Fireworks over Church Tower. I usually use the camera screen to judge exposure. That is, I set the aperture wide open and shoot at whatever exposure time I have guessed. Usually 1/60s is a good place to start as any. It is normal to see some blown highlights in the middle of the explosions and at the back of the rocket engines. Because of this the histogram and the blinkenlights are useless. Instead, ensure that the night sky is black and that the fireworks are clearly visible. If the sky is too light, shorten exposure time and/or reduce the ISO. Similarly, if the fireworks are too dark, lengthen exposure time and/or increase the ISO. Once I have set up the exposure correctly I point the camera at a likely section of sky and snap away. Since the exposure will not change, I only change it to get a different effect. There is no need to check every image.